Social media platforms including Facebook, Instagram and Twitter are facing demands from the government to protect children and teens from harmful content on the Internet, following growing concerns over self harm and suicide amongst teenagers. The new Facebook vice-president Sir Nick Clegg told the BBC that they will do “whatever” it takes to make its social media safer for young users. This response follows from the case of 14-year-old Molly Russell, who sadly took her own life in 2017, after being exposed to self-harm images on Instagram. Sir Nick added that some experts say it’s wise to keep certain images up because they can actually help people find the help and support they need, but also admitted that he would not let his own children view the highly graphic images. Following Molly’s death, her family looked into her Instagram account and found distressing content relating to depression and suicide. Her father stated that he believed Instagram was partly responsible for his daughter’s death. However, he also added that experts advised not to ban all content of this type, “I know this sounds counter-intuitive, but they do say that in some instances it’s better to keep some of the distressing images up if that helps people make a cry for help and then get the support they need”. Sir Nick also brought up Facebook’s taxes at his first public appearance as the platform’s head of communication, where he said Facebook should pay more outside the US. “This is what needs to change,” he said, as well as adding that the duty was on governments to come up with “a better way to tax companies like Facebook”. 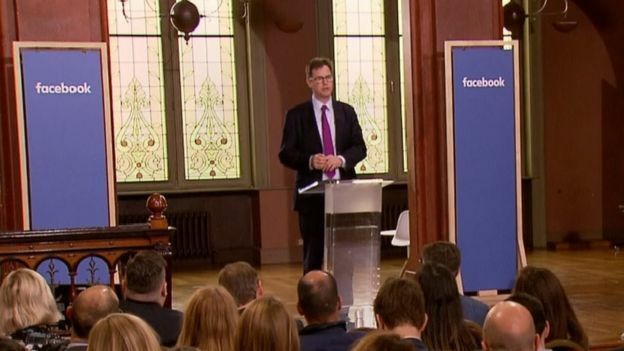 Following his interview with the BBC, Sir Nick made a public speech, announcing the creation of an external body to help Facebook users challenge decisions made over flagged content. It was also acknowledged that the platform had a responsibility to limit the potential for political damage caused by the spreading of fake news. However, he defended Facebook’s business model of using personal data to sell targeted advertising, rather than charging users a subscription, some of which could not afford it. The collection and sharing of a user’s personal data include location, shopping habits and holiday plans – something that Sir Nick says is now “routine” among many private companies and public sector organisations. Sir Nick added that he had seen “many changes” on Facebook since he joined in October last year. This was a surprise to many, given how he had written negatively about the social network in the past. Clearly, there’s an idiosyncratic debate on when Nick Clegg actually joined Facebook and one now wonders just how much of his political past played a role in him becoming the new communications director. However, the important thing is to remember not to be influenced too much by the content that we see on social media, especially when it comes to sensitive subjects including self harm and suicide. We encourage you to seek help and support if you are struggling with any kind of depression, anxiety or suicidal thoughts, and keep away from this sort of content online. Previous Article← What about Nancy Pelosi’s link to “El Chapo” Mexican Drug Cartel Nieto Bribe & Other Acts of Treason?